Equip with the Ultra Racing?s strut bar and lower arm bar, both side shock of impact will be neutralized. handling and increasing body roll. 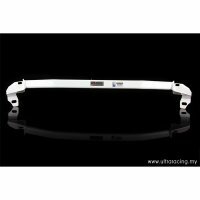 The force will spread out by Ultra Racing?s strut bar and lower arm bar, stabilize the car and provide solid handling. Every materials used are carefully selected to ensure the best performance and safety. The brackets are made of 4mm to 5mm steel plates, while the hollow steel tubes and oval tubes are of 1.2mm to 1.6mm thickness. These materials are selected to ensure the bars are rigid and strong to maintain constant geometry at all times, yet safe enough to crumble during an impact for safety reason. All our raw materials has been made and tested with satisfactory result. Why Ultra Racing use Steel instead of Aluminum? First, steel is stronger than aluminum for the same size and thickness. In order for aluminum alloys to be at least the same strength as steel, it has to be at least double the thickness (steel 4mm = aluminum 8mm). When that happens, weight saving is not so apparent anymore. Of course there are also exotic materials and alloys that can match the strengths of steel, but the cost are astronomically high and therefore not very cost effective to bring into mass production. 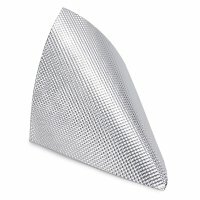 DEI Extreme Heat Shield "Floor & Tunnel Shield II"